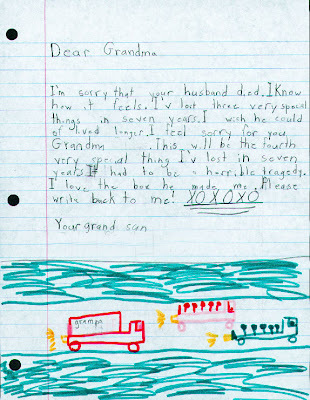 I posted my seven year old's apology note he had to write for peeing in the decorative bathroom cup at his Grandma's so I thought it only fair to share the sweet note he sent my grandma after my grandfather died. I like his emphatic "horrible tragedy"(my Grandpa was 87, so while sad for those of us who knew and loved him, hardly a horrible tragedy). I also like the funeral procession he's drawn at the bottom. Him: Where is Grandpa now that he's dead? Me: Well, he wanted to be entombed so his body is in a casket, in a drawer in a big building called a mausoleum. Him: So when we go visit in summer, can we go see Grandpa? Me: Oh honey, that's sweet. When we're there in July we can take Grandma and go visit Grandpa together, she would really like that. We can even take her out to lunch afterward. Him: So what do you think Grandpa's going to look like after four months? Me: You do realize honey that while we can visit where his body is and see the plaque with his name on it, we're not going to actually see his body right? So sorry to disappoint. Maybe we need to take him to the Bodies-The Exhibition to satisfy some 7 year old curiosity. lol "Oh, then nevermind". Isn't amazing how kids can do that? We had to put our dog down today and I am still at that sad, shaky from crying stage, and my girls, who loved our dog like crazy, bawled like babies for a bit but are now having a water baloon fight in the yard with neighborhood kids. I'm sorry about your dog, they certainly become loved members of our families. Kids? Yes, thankfully they move on pretty quick.